Guyana has been stripped of its scheduled Test match between West Indies and Australia due to political interference by the country's government, the WICB has announced. The third Test of the series will now be held in Dominica from April 23-27, the dates unchanged from the original schedule. "The change in venue is as a result of the situation in Guyana owing to the Government of Guyana's push to take over the management and governance of cricket in the country," the WICB said in a statement. "The Guyana Cricket Board, which is the agent of the WICB and the legitimate cricketing authority, has been prevented from undertaking the necessary tasks needed to ensure the successful hosting of the match." Last month the Guyana Cricket Board (GCB) was locked out of its premises by the Guyana government, which appointed an Interim Management Committee (IMC) headed by Clive Lloyd to govern the sport in the country because the July 2011 GCB elections were being disputed. 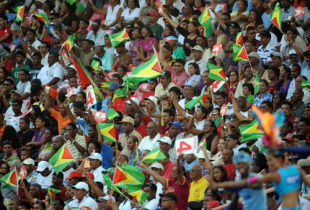 The ICC decried the Guyanese government's actions, stating after its most recent meeting that: "The ICC Board was concerned to learn of the developments in Guyana where the government has dissolved the Guyana Cricket Board (GCB) and replaced it with an Interim Management Committee (IMC)." "In condemning this government intervention in the strongest possible terms, the ICC Board reaffirmed the principle of non-interference and that the only legitimate cricketing authority is that recognised by the West Indies Cricket Board." In its annual conference in June, the ICC had taken a firm stance on government interference in cricket and had given its member boards two years to become democratised and free from government and political interference in a bid to improve governance within the game. In keeping with that stance, the ICC board strongly opposed the Guyanese government's actions. News Lloyd, Harper term Guyana elections "illegal"